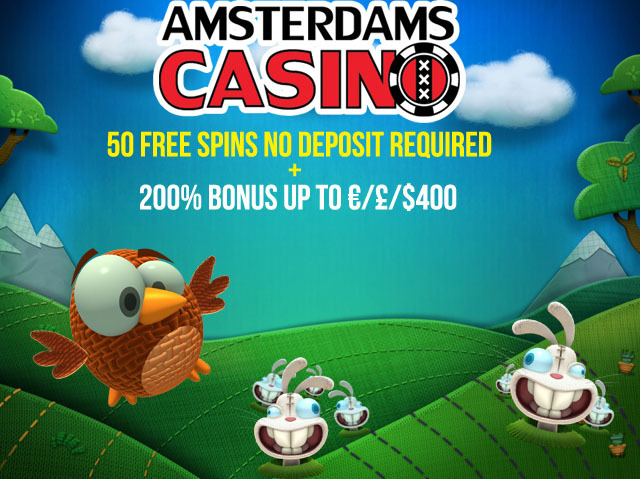 We have teamed up with Amsterdams Casino to kick off the 2016 New Year with an Exclusive 50 No Deposit free spins for all new visitors to our website. Additionally, Amsterdams Casino is also offering an awesome Welcome Bonus for ALL new players. Amsterdams Casino has overhauled their website to give it a fresh new look, just in time for the New Year. 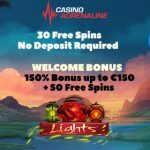 All new players will be eligible to receive 50 Free Spins No Deposit! Yes, you don’t need to make a deposit. Just sign up for a casino account. 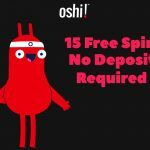 How do I get my 50 Free Spins No Deposit? Sign up for a casino account at Amsterdams Casino. 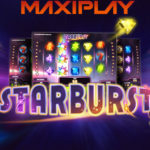 Once logged in, open up any of the following slots to receive your free spins: Starburst, Gonzo’s Quest, or Twin Spin. All new players at Amsterdams Casino are eligible to receive a super 200% Welcome bonus up to €/£/$400 on their first deposit. All that you need is to make a deposit of at least €/£/$20. Make the most of this awesome Welcome offer by depositing €/£/$200. You will receive a bonus of €/£/$400 and begin playing with €/£/$600. This Exclusive offer is only available on our website, Gameplayer-Casinos. You will only be able to access this offer from the links on this page. The maximum winnings that can be won from your No Deposit free spins is €/£/$50. The wagering requirements on your No Deposit free spins winnings is 35 times. The wagering requirements on the Welcome bonus is 50 times. Players from these countries are restricted from play at Amsterdams Casino: United States Minor Outlying Islands, United States Of America, US Virgin Islands, American Samoa, Spain, Israel, Belgium, Northern Mariana Islands, Turkey, Guam, France, and Italy. Beetle Frenzy, Gold Rush, Mega Joker, Pirate’s Gold, Safari Madness Super Nudge 6000, Jackpot 6000, Lucky 8 Line, Magic Love, Big Bad Wolf, Blood Suckers, Dead or Alive, Devils Delight, and Kings of Chicago. Live Casino and Video Poker count 10% towards wagering requirements. Table Games count 20% towards wagering requirements. Slot Planet Casino No Deposit Bonus – Get 22 Bonus Spins No Deposit on sign-up! ← Casino Cruise Xmas Free Spins 2015 Advent Calendar: The best biggest bonuses on the planet!